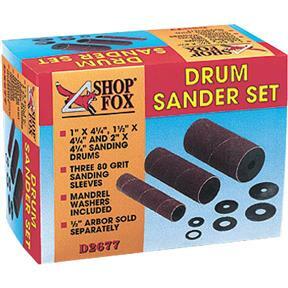 This Drum Sanding Set includes three 4-1/4" long rubber sanding drums. This set also includes one 80-grit sleeve for each drum to get things started. Note: Drum diameter sizes indicate OD of compatible sanding sleeves—not diameter of rubber drums. I have not had time to put these to use, but they seem to be of good quality and simple to use. Works great for sanding inside of drilled holes. Sand paper clogged up guicker than expected. Order extra, you will probably need them. This is exactly what I wanted and didn't take long at all to get once I placed my order. I will be ordering more from Grizzly soon! Great product, I found it useful right away. I am very happy with the product. I have the entire package of products to my liking. I already own enough machines and did not want to buy another to do the same job my drill press could do. Thank you Grizzly catalog. 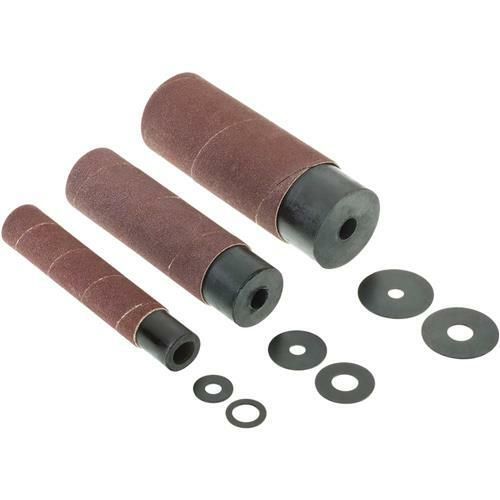 These sanding drums were what I needed for my Shop Fox drill press, but they did not included the mandrel nor the dust ring that goes onto the table of the drill press. I did order the mandrel separately but the dust rings were not available. Quality is excellent and the sanding sleeves are long-lasting. Other sleeves may be cheaper but these are long lasting and ultimately cost less. This is a nice set and goes well with the Shop Fox oscillating drill press my wife bought me for Christmas."